SelbySoft has a complete line of the new EMV or chip and signature machines available for you! EMV is the safest way to make sure you are not involved in credit card fraud and that you, and your customer, are completely covered. With our integrated side terminals, you are no longer touching the credit card. The customer simply inserts the card and follows the prompt. They can even tip right on the machine! Give us a call to see how we can simplify the process for you and your coffee or pizza shop. Here is some great EMV information from Novera Payments, a valued partner of SelbySoft. Visa and MasterCard have begun to bring the new EMV technology to the United States. For financial institutions, this means issuing cardholders new credit cards and updating networks to process EMV data. For merchants, this will mean purchasing new EMV-capable credit card processing equipment. EMV will benefit you in the form of increased security, reduced fraud, and even expanded marketing opportunities for small businesses. Here are four frequently asked questions to help you better understand this new program. When you look at your credit card, if you see a small metallic square, that’s a computer chip and it is what makes the card an EMV card. The basic difference between traditional credit cards with magnetic stripes and EMV cards with computer chips is that the magnetic strip cards hold static data and the computer chipped EMV cards hold dynamic data. If the magnetic stripe card is compromised, the data can be used over and over again because it doesn’t change. This makes it easy for fraudsters to profit from stolen card holder data. For the EMV card computer chip, with each transaction, a unique transaction code is generated and cannot be used again. That means if the credit card data is stolen from a single sale or transaction, the next time it is used, the card would simply be denied because the transaction code is no longer valid. This makes it much more difficult for nefarious people to profit from stolen card holder data. party in a fraudulent transaction. Novera and Selby Soft have an EMV implementation plan in place. Please click below to request more information. Increase speed of service: Cut some steps. With integration, you will be able to easily take the order, swipe the card and move on. Without integration, you are relaying on your employees to hand enter the amount of the transaction. Accuracy: Hopefully that ‘hand enter’ comment above led you to this one! Seriously, without an integrated system, you run the risk of the employee ringing in a $5.25 order for $2.55. Either way, the customer is upset and the store is out money. One of our Customer Service guys recently took a call from someone that was asking about some specifics in the way our Credit Card system is setup. That sounded like a good blog topic! SP-1 allows for some customization on the credit card side of things. Here are some of the most common items that we can customize. Credit Card Printing Threshold: This allows you to specify at what point you don’t automatically print a credit card receipt. For instance, if you set this to $20.00, credit card receipts will only automatically print if the ticket is over $20.00! Of course, you can manually print a slip if someone requests it. Number of Receipts to Print: Setting this to 2 will provide two separate receipts for your customer. Print Employee: You can choose to print the employees name, ID code or both on the receipt. Tip Description: Want to have the tip line print “gratuity”? Enter that here. Print Customer Name: If you have a name or a customer account attached to the ticket, then you can choose to print this on the receipt. 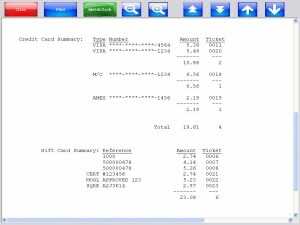 Print Voids: Selecting this will allow you to force a voided credit card slip to print. Tip Guideline: You can choose to print a suggested tip amount. You have two areas to fill a suggested percentage in. For example, if you put 10 and 20, then SP-1 will calculate the dollar amount of the tip based on 10% and 20%. Header: Enter in what you want printed on the top of the credit card receipt. Agreement: Enter in what you want printed on the bottom of the credit card receipt. Sometimes, that’s not enough. We have customers that take paper gift certificates, accept script, barter cash or even credit card transactions from an outside source like Square or Mogley. In SP-1 we have the ability to create five special payment options to record items like this. When you select the gift card button, you will see those buttons at the top. 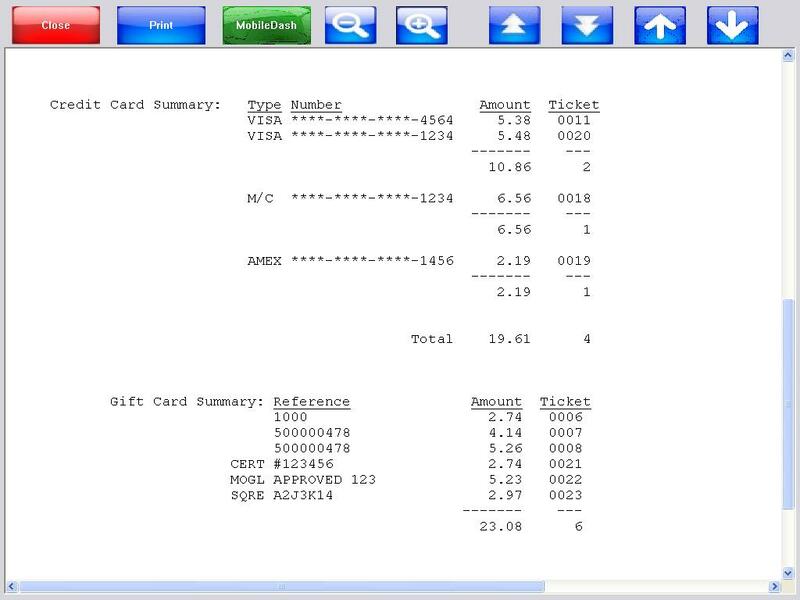 In the example below, you see Mogley, Square and Gift Certificate options. This will also allow you to record an account number or approval number on the transaction. Keep in mind that it does not process through those methods, just record that it happened. Of course, we will report on each of these as well (see below). Call us for more information! When talking to owners of food and beverage locations, I’m often asked about credit card processing. Usually the conversation revolves around if the owner should integrate the credit card processing into the POS or continue to use a terminal for processing. So what does integration have over terminals? Quite a bit . . .
No equipment needed. Since it is working through software only, you get to free up space on your counter. Ease of use. Your employees already should know how to swipe a card! Plus you have the card swipe for employee clock ins and gift cards already. Less mistakes. 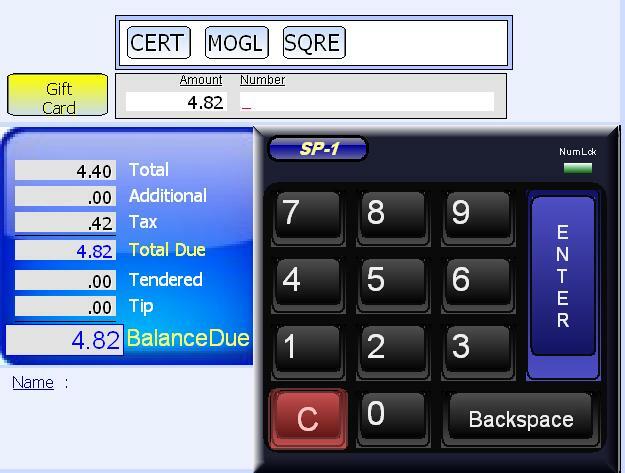 When credit card processing is integrated through SP-1, your employees don’t have to enter any information beyond the card number (and that is handled by swiping the card on the side of the monitor! Unlike a terminal, the employee does not need to enter the total dollar amount (eliminating those typos). Compatibility. We work with virtually every credit card processor out there. No issues with having to re-program a terminal. Flexibility. Have multiple stations? 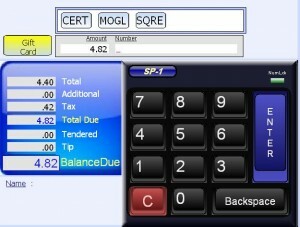 With the credit card integration you have the ability to take credit cards on all computers running SP-1 with no additional cost. No additional phone line. Since the credit cards are run through an internet connection, you don’t need an additional phone line. Who handles your credit card processing? Good question isn’t it? There are many payment processors to choose from. If you’re not sure which company is the best for you, we can help! SelbySoft has some preferred relationships with credit card processors that can save you money and help streamline your business operations. Customer Service. This is the most important thing we consider when evaluating partners, since it matters most to our customers. Mercury offers free, live customer and technical support, 24/7. They have shown a dedication to customer service that has helped our merchants maintain a reliable credit card processing system. Mercury Stand-In. This service is unique to Mercury. If there is an outage within the authorization network, Mercury implements their stand-in service that allows merchants to continue credit cardprocessing. Mercury “stands in” so business continues as usual for our merchants. Direct Integration. SelbySoft and Mercury have a direct integration which eliminates the need for a third party system like PC Charge. A direct integration helps cut future costs since no updates or support are required., Gift Cards. Mercury has a cross-store gift card program that supports pooling of gift card funds – ideal for merchants with franchises or multiple locations. Mercury also offers their customers free, unlimited gift card transactions. Lastly, Mercury can be very competitive with their rates. They also offer month-to-month contracts for merchants who prefer less commitment with a payment processor. Who doesn’t take credit cards in today’s world? We all know the statistics regarding how accepting credit cards will boost your sales and increase average ticket sizes. So, the question is how can we make this more efficient at the store level? By integrating the credit card system and getting rid of those separate units. With a separate unit, the transaction usually goes something like this. . . Employee rings up the order, selects credit cards, selects visa and then swipes the card through the separate terminal. . . at that point the employee enters at least the total and possibly the last four of the credit card, expiration and possibly the cvv. End result? The line is waiting. If you have multiple stations, then you are sharing or buying additional terminals. If it’s a phone or delivery order, it gets worse! The employee has to actually write down the information and hand key it in while the customer is on hold. Twice the work and twice the security risk! Now at the end of the night, you have to hope that the totals match, that an employees did not select cash in the POS and then still take a credit card and so on. So how can we make this easier? The employee rings the order up, swipes the card and is done. That’s it! Multiple stations? The interface works on all the computers in the location, each station will just swipe it on the monitor. Phone or Delivery orders? Simply type the credit card number directly on the screen and it will process. So there you go. . . A couple ways that integrating your credit card system can make your store more efficient and eliminate headaches for you, your employees and your customers!